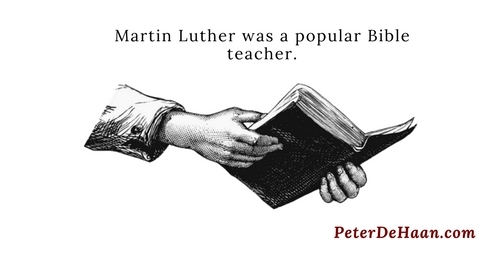 While studying law and not yet 22, Martin Luther went home for a visit. What he experienced along the way reminds us of Paul’s conversion experience on the road to Damascus (Acts 9:3-4). Caught in a thunderstorm, a nearby lightning strike knocked Martin from his horse. Fearing death from the next flash of electricity, he pledged himself to a lifetime of service to God if Saint Anna—who protected the miners—would also save him. The nearness of death and fear of eternal judgment gave him the push he needed to pursue God’s will instead of his father’s. Martin stopped his education in law and entered a monastery under the order of Saint Augustine. Despite following God’s call on his life, Martin’s struggle with his perception of God’s high demands and inevitable punishment continued at the monastery. There he engaged in extreme, self-inflicted practices of mortification, which he later called his martyrdom, to try to conquer his desires of the flesh. His mortifications included fasting to the point of being unable to move, locking himself in an unheated cell for prayer until anxious friends broke down the door to save him, and praying at the altar until he passed out. Yet none of his efforts lessened his terror over God’s judgment. In fact, the harder he tried to keep God’s commandments, the worse he felt. Even participating in the Church’s sacrament of penance failed to provide the relief he sought. Though many in the monastery tried to ease Martin’s internal spiritual struggle, no one had much success. Later, in 1510, while on a trip to Rome, what Luther saw there shattered his idealism over Church practices. Rome had become anti-Christian, with the pope and cardinals giving in to worldly pursuits and corrupt practices. They strayed far from what the Bible taught and made up doctrines that suited them to wield power and amass wealth. In doing so, they pushed God aside. Disillusioned, this experience scarred Martin, and his despair deepened. Students flocked to his classes. They embraced his bold teaching and his fresh examples that gave his words meaning, so different from the methods of other professors. In 1516, Martin published his first book, based on his lectures on the book of Romans. His renown as a scholar, professor, and preacher grew. Over his lifetime, many more books would follow. Martin continued to study the Bible, and he struggled with what he read. Though a devout Catholic and not a rebel by nature, his anxieties wormed their way into his teaching. Martin loved his Church, its traditions, and its common people—which he was by birth. Yet out of integrity, he spoke with honesty instead of blindly repeating what the Church leaders decreed; he saw some of the instruction from Rome as heretical. This prepared him to act, something that would change his life, along with the rest of Christianity.